Ex Libris: Guest post: The Bookmark Saga by Linda Poitevin + Giveaways! Guest post: The Bookmark Saga by Linda Poitevin + Giveaways! Today I am very happy to welcome back to the blog Linda Poitevin, one of my favourite UF authors, who is here today to celebrate the release of Sins of the Son, the second novel in her Grigori Legacy series. I LOVED Book #1 Sins of the Angels (you can read my detailed review here) and was counting back the days 'till the release of Sins of the Son, and though the wait was long I can tell you it was so worth it! 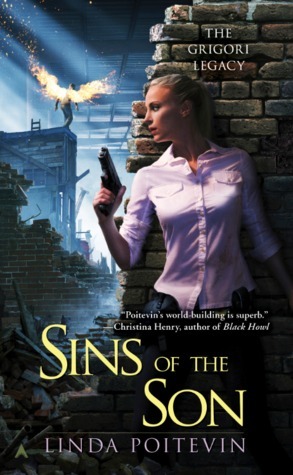 Sins of the Son was just as phenomenal as its predecessor, Linda Poitevin takes the reader on a whirlwind rollercoaster ride which will leave you breathless and reeling long after the ride is over! If you haven't read Linda Poitevin's UF series yet, you shouldn't waste any more time, because as I have already told you the Grigory Legacy series is one of the best UF series I've read: "it has everything: fast paced action, rich worldbuilding, wit and humour, deep and layered characters, sizzling chemistry and much much more". One day, while perusing the Internet for marketing and promo ideas, I came across a blog decrying the use of bookmarks as a promotional tool. The author commented that in her experience, bookmarks weren’t worth the money spent on them because they generally ended up being tossed out. Having just purchased 1,000 of these fine promotional tools, I was gobsmacked. Especially the ones that you send to conventions and hand out at book signings, this blog post responded, unless you do something to make them less discardable (I know, not a real word, but bear with me) and more keepsake-worthy. “What a great idea!” I thought. And “easy!” I decided. After scouring the Internet, I found a bulk supplier of pewter wing charms and ordered 500 of them. After all, if I was going to do this, I may as well do it right. Right? The charms arrived two weeks later. With a firm vision in mind of what these wonderful keepsake bookmarks would look like, I drove to the craft store and selected two different types of ribbon with which to attach said charms to the bookmarks, and returned home. Lo, the hole on the wing charm was too small for the ribbon—and the charm itself was too small for the bookmark. Even when I did manage to force one of the wings onto a ribbon (a task requiring two sets of pliers and much muttering on my part), the wing looked ridiculous dangling from said ribbon. “Hm,” I said. And back to the bookmark-designing board I went. Two additional—and unsuccessful—excursions to craft and sewing stores later, I still hadn’t found a suitable solution for attaching the charms to the bookmarks (for suitable, read: anything that wouldn’t look like it had been put together by your average four-year-old). I returned to the Internet. Much perusing later, I found a supplier of ready-made bookmark tassels, chose a color, and placed an order for…yup, 500. Then I went to a local bead store, found some coordinating beads that I could add to the wing charm to bulk things up a little bit, bought the little head pins to put through the beads to create a hanging loop on each of them, paid to have someone at the bead store create those loops (with pick-up scheduled for a week later), bought 500 jump rings from which to hang the wings and newly looped beads, and headed home. Again. Then I started a massive mail-out campaign and used all my flipping bookmarks. 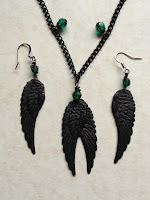 While waiting for beads to be head-pinned and looped, and for the tassels and new bookmarks to arrive, I decided to get a start on assembly by attaching the wings to the jump rings. Except…the rings I’d bought were too large to fit through the stupid hole on the stupid wings. Seriously. Taking a deep breath and trying to still the misgivings I was beginning to feel with regard to my ‘easy’ project, I set aside the rings for exchange at the bead store when I went back for the beads. The tassels arrived…along with an additional (and unexpected) $47.21 bill for a brokerage fee from the courier. Again, seriously? Having no other choice –I was in too far to quit now! 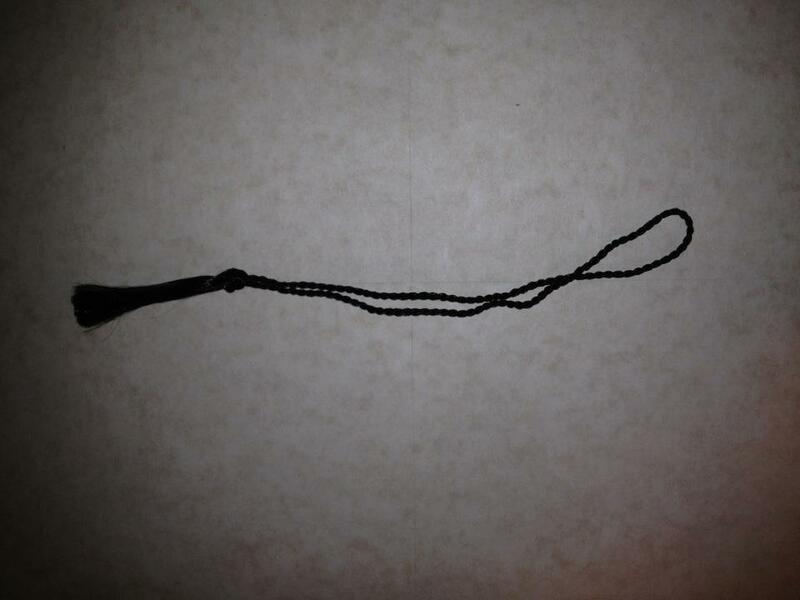 – I paid, opened my package, and took out the tassels. Mild hysteria set in. They were too short. Not just a little too short, but WAY too short. They looked as pathetic tied onto my eight-inch long bookmarks (I tried, just to be absolutely sure) as the wings had looked dangling from my earlier ribbon efforts. By this point, I was certain the universe had drawn a bull’s eye on my forehead (my ensuing language was not pretty), but if it thought it could make me give up, it was sadly mistaken. Back to the *@!%! Internet. Two emails and three phone calls later, the very nice lady at Tassel Depot had come up with a solution for me, sent me a return form, and put in a new order. Then it was back to the bead store to pick up my head-pinned beads and exchange the jump rings, this time with my entire stock of everything—except tassels!—in hand. I explained the problem to a girl there who was very sweet but obviously disbelieving of my jump-rings-being-too-large plight. She asked if she might try putting one of the wings onto a ring and I was only too happy to hand over my goodie bag. She took out a wing and a jump ring, brought them together, and…the ring slipped through the hole in the charm. Without. Effort. Of any kind. The very sweet girl looked at me. I looked at her. The very sweet girl named a price. I agreed (I would have paid twice the quoted fee), paid, and left again. More waiting. A week later, the bookmarks and tassels arrived, the bead store called, and…I had the flu. First time in four years that I’d been sick. Yup. Universal bull’s eye. I’m convinced. Linda Poitevin is the author of a new urban fantasy series, The Grigori Legacy, from Ace Books. Book one, SINS OF THE ANGELS, is available, while book two, SINS OF THE SON, was released in March 2012. In her other life, Linda is wife, mother, friend, gardener, coffee snob, freelance writer, and zookeeper of too many pets. 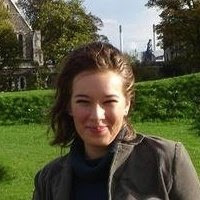 You can find Linda at her website, blog, Twitter and Facebook. 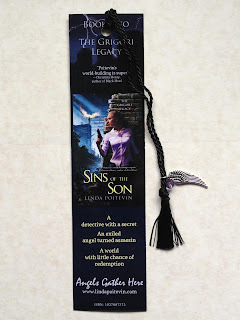 Linda has generously offered Sins of the Son bookmarks to 5 lucky commenters! By commenting you could also win a copy of the amazing Sins of the Son! 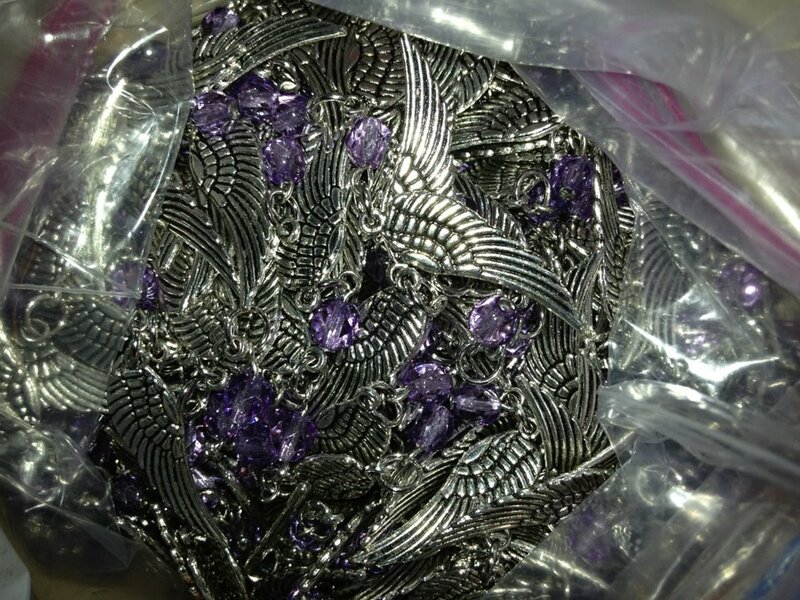 All winners from each individual giveaway on the tour are going to be entered into a final grand prize draw (Canada/US) at the end of the tour for a necklace/earring set designed by Cemetery Cat (@psynde on Twitter). All you need to be entered in the drawing for the 3 giveaways is to leave a comment, either about Linda's post, her series, your take on angels, UF novels or anything else that you feel like sharing (maybe one of your own big frustration tale about a project?). Giveaway is open worldwide and ends on 26 April 2012! For more chances to win enter the giveaways on the other blog tour stops as well!